Carma Poodale : B/W -PoodleBall Time! Yep! That is me. I am low to the ground right out of the gate and all fours were off the ground except ma just had her phone and not a camera so no great photos like your mom gets. Oh ya, we love fetch. Well Torrey does, I just cheer. That is so true! 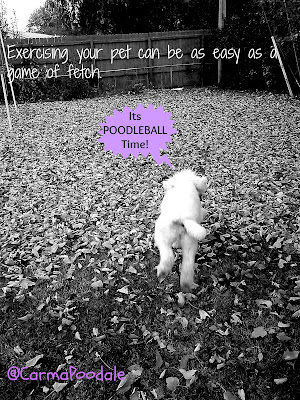 Joker loves playing Fetch it takes just 5 minutes to get him pooped out!! Fetch is one of my favouritest games! ....Ball? Fetch?! Those are two of my favorite ever words!! You look like you're having lots of fun...not surprising if you're playing Fetch! Niko plays fetch anywhere and with anything! Sophia doesn't really get into it. You must explain..what's a poodle ball? !